Many people with lupus (systemic lupus erythematosus or SLE) wonder if they can donate blood, especially when hearing that blood donations can save lives. Some organizations and blood banks accept donations from people with lupus, whereas others do not. When lupus fits the eligibility criteria, however, it usually requires that the disease be inactive or in remission. There are potential risks and benefits to consider, and everyone will have to decide along with their physician whether giving blood is advisable or not. Keep in mind that even if you are unable to donate blood, there are many ways that you can "give back" or help others coping with illness and disease. Whether or not you will be able to donate blood with lupus depends not only on the status of your condition but on where you choose to donate blood. Blood banks can vary considerably in their requirements and guidelines so that you may be able to donate somewhere even if you are told you are ineligible at one organization. It may take some legwork to find those who will accept our blood. There are also some reasons why people with lupus may not be able to donate blood for others regardless of the organization. Each blood bank and donation service has different requirements for blood donations. In the past, the American Red Cross did not accept blood donations from people with lupus, but this has changed. People with lupus can now donate blood as long as their disease is inactive or in remission, and they are healthy at the time of the donation. Memorial Sloan Kettering Cancer Center will accept blood donations from people with lupus only if they are asymptomatic. The National Health Service in the U.K. allows blood donations only from those who have not required treatment to suppress the disease within 12 months and if the heart is not involved as part of the condition. In contrast, the NIH, Providence Health, and the Australian Red Cross currently state that autoimmune diseases such as lupus disqualify people from donating blood. The Australian Red Cross claims that they are concerned not only about the risk to the recipient of the blood, but that giving blood could have a negative effect on the disease course for those with lupus. Just as the American Red Cross changed their eligibility requirements so that people with inactive lupus may give blood, other organizations may do so as well, so it's important to check the latest guidelines if you are interested. If you are taking some medications: In general, drugs such as Plaquenil and corticosteroids may be acceptable, but methotrexate, CellCept (mycophenolate mofetil), and biological agents (such as Benlysta (belimumab) are not. The reasons for these restrictions is again two-fold. There are many uncertainties associated with lupus, and it's not well known how donating blood will affect someone with lupus, nor how exposure to components in the blood may affect the recipient, especially in those who are very ill or immunosuppressed. Since antibodies found in the blood are the primary cause for concern surrounding blood donations from people with lupus, plasma donation is usually discouraged. Red blood cells and platelets from people with lupus are generally considered "safe." Having lupus, even in remission, is usually a contraindication for bone marrow donation. Be the Match excludes people with an autoimmune disease other than stable autoimmune thyroid disease. People with lupus may or may not be able to donate organs. The only two absolute contraindications are HIV infection and Creutzfeldt-Jacob syndrome. With lupus, problems with blood clots (antiphospholipid syndrome) would be one reason why doctors may think twice. In many cases, the benefits (living) may easily outweigh the potential risks. Can You Catch Lupus From Another Person? Even if you can't donate plasma to help someone in need, there is another option for people with lupus. There are several organizations requesting plasma donation from people with lupus in order to study the disease. Many of these are paid plasma donation studies, so those who are disappointed that they can't "give back" by donating blood (if they can't) could actually give back in two ways; their donation could further study on lupus, and they could use the monetary aspect to assist people struggling with their health (and life) in other ways. The first step before you donate blood is to consider whether it is right for you. There are other ways you can help or give back, and you don't need to risk your health to do so. Potential risks could include worsening of your disease (only you know the factors that may set off a lupus flare for you). 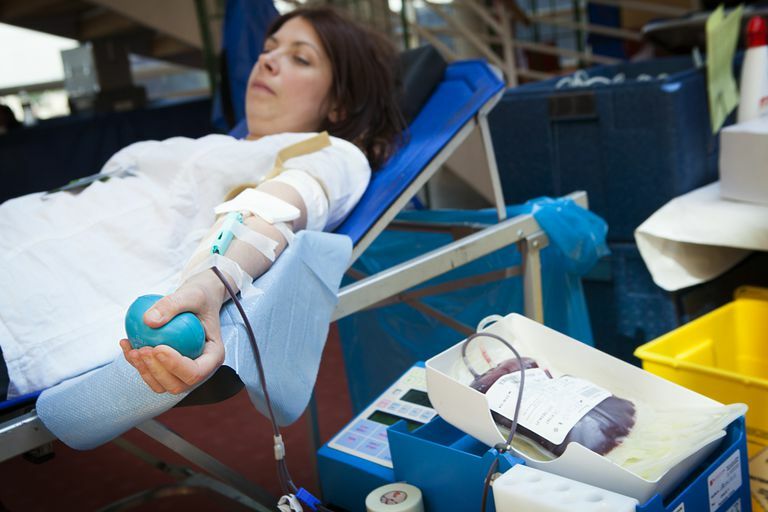 If you have fatigue associated with your disease, donating blood could make it worse. Donating blood may also exacerbate heart issues associated with lupus. Against the risks to weigh are possible benefits. Due to inflammation in blood vessel walls or through triggering blood clots, lupus may increase the risk of strokes over the long run. And studies have found that people who regularly donate blood have a lower risk of stroke and heart disease. While more is heard about issues surrounding anemia, iron overload can also be a problem. In fact, "bloodletting" or regular removal of blood such as with blood donation (therapeutic phlebotomy) is a treatment for those with hemochromatosis. If you meet the criteria to donate, talk to your doctor first. Even if you are in remission and your disease is inactive she may have some specific reasons why you should not donate. If you are disappointed, she will probably have some idea where you can use your desire to help others in a different way. Before doing so, however, make sure you are living and coping with your lupus as well as possible. People who take care of themselves first are better able to help others. If you are able to donate, it is a noble endeavor, as one blood donation can help save up to three lives. According to the Red Cross, every two seconds someone in the U.S. needs blood and only 5 percent of the eligible population donates in a given year. There is no blood substitute and donors are the only sources of blood. Donated blood is used not only in emergencies but also for people who have cancer, blood disorders such as anemia, and many other illnesses. That said, many organizations do not allow people with lupus to donate, and if they do, the guidelines can significantly limit who may give blood. There are unlimited ways in which you can help others, however. You may wish to begin by checking out some of the ways that you can be a lupus advocate in your community. American Red Cross. Eligibility Criteria: Alphabetical.